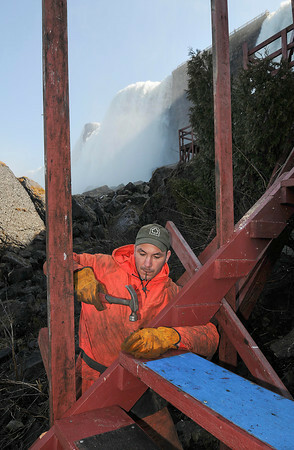 James Neiss/staff photographerNiagara Falls, NY - Cave of the Winds deck builder Travis Saturley, hammers a step into place on the first day of deck building this year. Saturley, said he prefers a little colder weather when building the decks at the base of the American Falls, because of all the clothing they need to wear that protect them from the mist. The Cave of the Winds tour is one of the most popular attractions at Niagara Falls State Park.